Karen Sigmon-Smith began writing in 1995, focusing on health-related lifestyle modifications. She has written chapters for medical textbooks, articles for public health journals and wellness newsletters, and a newspaper column, "Life in the Health Lane." Sigmon-Smith earned a Master of Public Health from the University of North Carolina at Chapel Hill. Irritable bowel syndrome (IBS) is a disorder of the muscular movement in the digestive tract. Physicians are unsure of what causes it but believe there is a problem with the signals between the brain and intestines. Symptoms may include belly pain, bloating, cramping, diarrhea and constipation. IBS is a long-term condition, but symptoms can be controlled with diet and lifestyle. The primary way to manage symptoms is to replace trigger foods with healthy alternatives that promote smooth, painless digestion. There is no better way to initiate control on a daily basis than to eat a healthy IBS breakfast. When choosing the best cereal for IBS, look for high-fiber content. High levels of fiber in the diet keep the colon slightly distended, which may help to reduce or alleviate muscular spasms that cause IBS pain. Whole-grain breads and cereals, as well as fresh fruit, are excellent high-fiber foods to start the day. High-fiber foods supply at least 20 percent of the recommended daily allowance (RDA). According to the U.S. Food and Drug Administration, the RDA for fiber, based on a 2,000-calorie diet, is 25 grams. Whole-grain bread selections may include toast, bagels or bran muffins. Examples of popular high-fiber dry cereals are All-Bran, Fiber One and Grape Nuts. Fruit selections with high-fiber content include raspberries, pears, apples, strawberries, bananas and oranges. 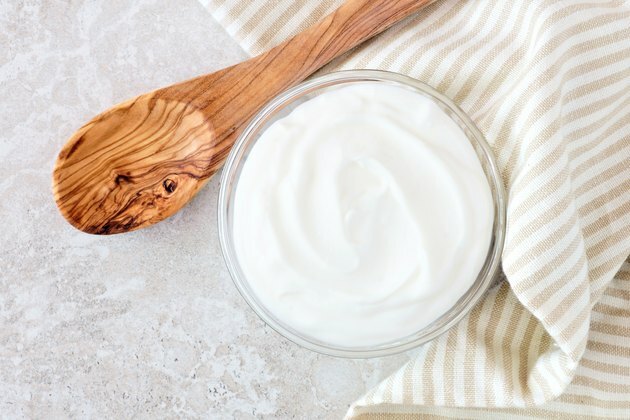 Dairy products, such as butter, cheese, milk and yogurt, are an important part of a healthy breakfast due to their protein and calcium content in particular. However, dairy products are common triggers of IBS symptoms. While some form of dairy should be consumed each day, sufferers should choose a single type to enjoy with their IBS breakfast. If milk is eaten with dry cereal, for example, peanut butter, honey or jelly should be eaten with a side of toast, rather than butter or cheese. Fried foods are high in fat and are particularly problematic for IBS sufferers. Starting the day with fried foods is a bad idea, as the digestive system gets bogged down and irritated right away. Therefore, eating sausage, bacon or ham as a source of protein for breakfast is not a wise choice for your IBS breakfast. Spread peanut butter on a whole-grain mini-bagel, English muffin or piece of toast instead. Egg whites, oatmeal or cereal bars are better choices as well. According to a study published in 2014 by Gastroenterology and Hepatology, research suggests that IBS sufferers often have a sugar intolerance. IBS sufferers frequently have difficulty digesting high-sugar foods as well as sugary beverages. Given this, make sure to choose high-fiber, high-protein breakfast cereals rather than sugary ones, such as Frosted Flakes, Corn Pops, Froot Loops or Apple Jacks. Be careful not to add multiple teaspoons of table sugar to your bowl of cereal or oatmeal either. Replace soda or flavored fruit juice with water or 100 percent fruit juice for breakfast to complete a healthy start to your day.